In order to ship sales order details, WHM creates shipments and loads. A WHM Load is a set of sales order details grouped together and going out on a single truck or rail car or other mode of delivery. A WHM Shipment is a group of sales order details going to the same destination on the same load. A load can have one to many shipments. A shipment can have one to many sales order details. Either way, WHM replaces the pick list and packing slip processing of sales orders. If an order is run through standard WHM processing, the posting of pick lists and packing slips are handled by WHM. The shipment flow describes a method where a single sales order creates a single shipment which then creates a load. Typically this means a single sales order is tied to a single shipment. This shipment is then tied to a single load. To create the single shipment and load per sales order, the user releases the entire sales order to the warehouse using the Release to Warehouse button found on the right hand side of the sales order detail form. WHM will then create the load and the shipment. Based on parameters, WHM can also add the load to a wave, execute the wave, and even release the work for picking. This method creates a single load and a single shipment per sales order. Also, the Release to Warehouse requires that all items on the sales order are reserved prior to running the Release to Warehouse. The Release to Warehouse will not run if the entire sales order is not reserved. 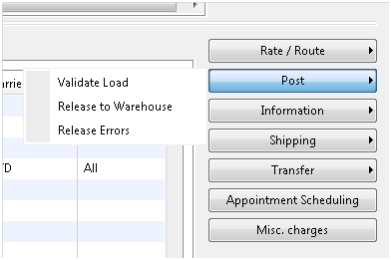 The parameter for Loads: Auto-Create at Sales Order Entry should be set to unchecked. This will prevent WHM from creating loads during order entry. The WHM Parameters Screen is found in the Warehousing for WHM/Setup/Parameters. In WHM parameters, on the second tab called “Loads” there are a few customizable options before creating loads. These options allow a load to be auto created when a sales order has been created. Transfer orders and purchase orders can auto created loads as well. Consolidate loads during wave execution allows multiple shipments going to the same place to be consolidated under one load. Once a sales order has been completed, the next step is to add the order to a load. This can be accomplished by accessing the load planning workbench directly from the sales form. This workbench can also be used for warehouse transfers and for purchase orders. From this one form, there are several options to work with the inventory. For instance, a sales order can be split amongst several loads, all the items can be put on one load, change posting quantities, and add new lines to an existing load. A load can be created by using the menus on the top right or by simply dragging lines from the top grid down to the bottom load line grid. To create a brand new load, use the button called “add order to new load”. This will take all the line items from the sales order and bring up another form asking what the load type will be. On the load template assignment form, first a trailer type is selected. Next, the quantities to be added to the load can be changed. If a quantity is reduced, the remainder will stay on the top grid, and the rest will become part of the load. The Quantity Left to Structure column tells the user how much is left to load. Once load lines have been added to the new load, the order needs to be released to the warehouse, which is accomplished by posting the load. From the post button, the load can be validated if it has been setup correctly, release the load, and see what errors there are. Once the load has been released an info log message is displayed saying the load posted successfully. If the load did not post, WHM tracks the errors. Select the release errors button to see the errors. WHM provides a way to override many of the errors so the load can be released to the warehouse anyway. The load details form gives an overview about the load and load lines. From here wave details, work details that have been created, and make location changes can be accessed. Open means the load has been created but not posted or released yet. Posted means the load has been released to the warehouse but a wave still needs to be created. Waved means a wave has been created, the load assigned to it, and ran successfully. This means work has been created as well. Loaded means all the work has been picked and completed. Everything is on the truck. Shipped means the load has been ship confirmed and has left the building. Another feature from this form is the location change button. Once a wave has been executed and work has been created, usually the work will be left on the dock. From here, a user can change where the final put location will be. In this example the work was created to have the work be left at the bay door. The user in this case wants to change it to be the final shipping location of BAY-01. When this is done, the system goes though and updates the location on the work. This can also be done for staging locations. In order for this feature to work correctly, the location types must be setup on the WHM parameters form. Wave Templates are used to define the wave execution process and setup criteria for when waves are created, executed, and released. Multiple wave templates can be created, each with different properties. When you first create a wave template base methods will created as steps for that template and appear in the lower left grid. Any custom wave execution methods will appear on the lower right grid and can be manually added to the wave template using the arrow buttons. Based on the wave template setup the wave process can be very automatic or very manual. There are several properties that determine this described below. Auto Create Wave – If this is checked waves will automatically be crated for shipments at release to warehouse. The query criteria can be used to limit what shipments will apply to this wave template. 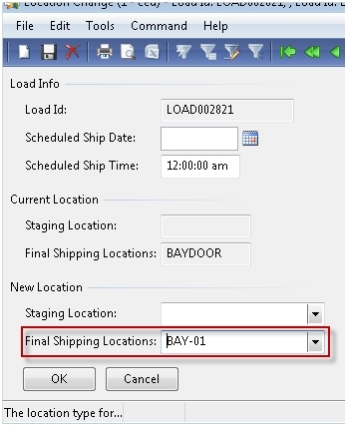 Assign to Open Waves – If this is checked shipments will be assigned to open waves at release to warehouse. The query criteria can be used to limit what shipments will be assigned to waves of this template. Auto-Execute Wave at Release to Warehouse – If this is check waves created during the release to warehouse will automatically be executed to create work. Auto-Execute Wave at Threshold – If this is checked waves will automatically execute when a defined threshold is reached. Auto-Release Wave – If this is checked waves will automatically be released once it is executed. Wave Template Seq – This sequence number determines in what order the wave template will try to be used when creating waves and assigning shipments to existing waves. If a shipment does not fit the query criteria of a wave template it will try again with the next wave template in the sequence. Waves can also be run in batch mode. Because large waves can take time to process, especially when location directives are complicated, it is beneficial to run waves in batch. This will free up the client and instead process the wave execution on the assigned batch server. Setting for batch waves can be found on the WHM parameters form on the general tab. Check the execute waves in batch, assigned a batch group, and set the retry delay count in order to execute waves in batch. Waves are needed to create work for a load or shipment. Work is created through the wave that will run and execute steps defined in the wave template. The manual steps taken to create and process a wave are as flows. First go to waves place screen. From there, find the button on the top menu called “create wave”. Search for the load, sales order number, or shipment that needs to be executed. Click the checkbox called “add to wave” and the line will be added to the bottom grid. The user can add several loads to one wave to make it a faster process. This is also how to consolidate shipments automatically. 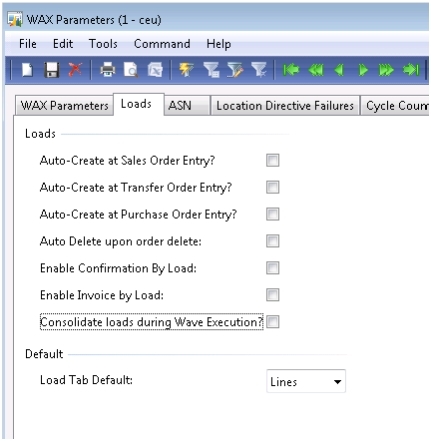 Once the loads and/or shipments have been added to the new wave, click execute wave on the form or on the waves place screen. This process goes through the wave template steps. It uses work templates and location directives to decide how to create the work. These settings are configured on other forms. If the execution went successfully, the new status of the wave will say “Held”. No work can be completed until this wave has been released. At this point, you can look at the work and see if it was made correctly and if you want to continue or cancel the work and start over. If all is created correctly, click the release button on top of the waves places screen. Upon releasing the wave, more work can still be created if not all the inventory was available at the time the wave was originally run. Any work that has been cancelled or not created for a load or shipment, will allow the user to create multiple waves for the same load/shipment. To see how much work a wave goes through, click the work creation history log. Once you filter on this form, you can see all the locations and steps work uses to create steps for users. Also, when a wave is released, it cannot be re-executed if any part of the work has been completed for it. In that case, you will have to create a new wave for the cancelled portions.